American Wolf: Washington 2014 (Seen The Lights Go On For Billy): The Gershwin Prize Concert. Washington 2014 (Seen The Lights Go On For Billy): The Gershwin Prize Concert. It was a pretty good night for a Wednesday & Justice Sotomayor gave him a smile. But the implications remained--many of Joel's signature songs like "Just The Way You Are," "Movin' Out (Anthony's Song)," "Only The Good Die Young," "She's Always A Woman," & "Scenes From An Italian Restaurant," were from this one album. Sure, he had other great songs, but the Gershwin Award? I remained skeptical. 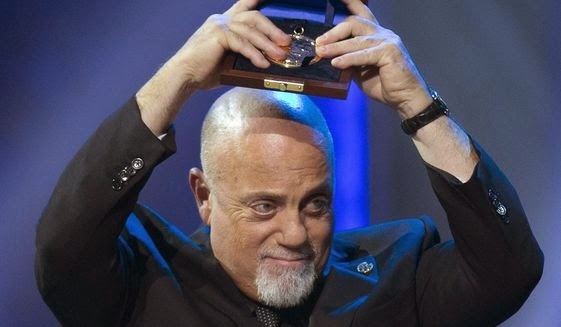 Well, after spending a week straight listening to nothing but Billy Joel, I had the honor last night of attending the ceremony at the DAR Constitution Hall in downtown Washington, D.C. It was a very D.C. show--everyone was in their Paul Simon bow-ties (the late Illinois senator, not the former Garfunkel partner who won the first Gershwin Award) or in their Hillary pantsuits, except for the older ladies, who were dressed like Madeleine Albright. Flanking Billy Joel in his box seat were Dr. Billington & Supreme Court Justice Sonia Sotomayor, the latter of whom received the most applause after the Piano Man of honor himself. Boyz II Men opened the show with a rousing rendition of Joel's doo-wop revival hit "For The Longest Time" (the original of which featured Joel doing all 14 vocal parts). Leann Rimes reminded everyone why she once beat out Britney Spears & Christina Aguliera for Best New Artist at the Grammys when she belted out "Lullaby (Goodnight, My Angel)"--& also demonstrated that the otherwise marginalized late-period Billy Joel song deserves a reappraisal. Former lead Dixie Chick Natalie Maines (A.K.A. The One Who Was Embarrassed By Bush) switched the genders around on "She's Got A Way" & reinvented it as lovely country tune, finding the folk song hidden inside of it that its simple structure had always implied was there. Meanwhile, Josh Groban proved that he is a talented singer but that even the most delicate Billy Joel material (in this case, "She's Always A Woman") isn't best suited for a classical voice. Gavin DeGraw did a fine-but-ultimately-forgettable romp through "It's Still Rock & Roll To Me," the greatest song to ever mock New Wave while sonically embracing it. (It was also Joel's first #1 hit.) The only real disaster was John Mellencamp's case for Joel as a protest singer, with an acoustic version of "Allentown" that sounded like a misguided outtake from Bob Dylan's The Times They Are A-Changin' LP. Mellencamp played it loose & understated, with an accompanying guitarist who never seemed to lock in with what he was doing. Ultimately, the punchy melody that drives the original was lost in a sea of well-meaning but confused rasping & strumming. The only person to receive a standing ovation from this opening set was Tony Bennett, who closed with a perfect take on "New York State Of Mind." Here was a song that was written & conceived for a lounge/jazz singer like Bennett--& he sang it like the old-school New Yorker that he is, mixing the jazz, pop, & perhaps, a touch of rock. Somewhere, the Gershwin Brothers were smiling. But all of this combined proved to be merely a flicker before Joel came out & burned the place down. He played his songs so thoroughly & theatrically, I was shocked to realize afterwards that his set was a mere 4 songs. He opened with "Movin' Out (Anthony's Song)," riding the driving verses into the thrashing pre-chorus with such flair that it made you forget the entire evening of music that had come before it. He then played "Vienna," which for my money is the finest song he has ever written--opening & closing with a lilting cabaret figure, he builds the melody up & brings it down with a promise of escape couched in words of pragmatism. "Dream on," he sang to the newly-minted Gershwin Prize facing him on his piano, "but don't imagine they'll all come true." Well, most of the time anyway. Joel next unleashed "Miami 2017 (Seen The Lights Go Out On Broadway)," an apocalyptic tale of a post-future New York City that was the highlight of the night. Originally released in 1976, it took on a new significance a quarter century later, when it came eerily close to prophecy. It is a song about the Brooklyn bridges blowing, the Harlem churches burning, & the mighty Manhattan skyline falling. But it is an old man's tale, shrouded in mystery & memory; for all of the song's chaos & destruction, its key words seem to be: "There are not many who remember--they say a handful still survive." It could be sung by the few survivors of the PS General Slocum steamship disaster of 1904 who were still alive to see the Twin Towers fall. Billy Joel closed his small set with "You May Be Right," the lead single (& a Top 10 hit) from 1980's Glass Houses, the most rocking album he would ever release. It is the best of his "angry young man" songs, a song of defiance that added up to more than the huffing & puffing its lyrics implied. This is a testament to the song's crashing, bashing music, which revels in the feeling of simple, stupid rebellion. Which only makes sense--isn't this night ultimately all about the music in the first place? With the thrashing bookends of "Movin' Out (Anthony's Song)" & "You May Be Right," Joel made his case for being a rocker, even when his reputation might imply otherwise. If the night had ended there, it would've been spectacular, but of course it didn't--there was still the obligatory "Piano Man" encore, which featured the ensemble joining in. Early reviews have called it the highlight of the evening, but they must've not been listening. From my seat, the whole thing seemed ad-hoc & ill-conceived (Kevin Spacey gets to sing more of the song than Billy Joel?! Boyz II Men & Tony Bennett don't get any feature spots in it at all?! Mellencamp didn't even bother to show up?! ), with its finest moments--a Boy II Man waltzing with himself, Groban & DeGraw swaying like the bar patrons they sing about, Rimes acting like a lovable kook--only speaking to how dispersed the performance was. The show deserved a better ending, & had they let Joel close it by himself, it would've gotten it. The whole thing airs on PBS on January 2, 2015, at 9:00 PM, so you can judge for yourself. Presumably there will also be the prerecorded congrats (from Streisand, McCartney, & James Taylor), the video interview segments with Joel (always interesting, if produced in a bizarrely shoddy manner), & the dance numbers from his Broadway musical (which might as well feature Eva Trapp dancing alone--despite all those around her, you won't be able to take your eyes off of her). Once the show had ended & I was tallying up the full setlist when I got home, I was struck by the small number of actual major Billy Joel hits that got played. Aside from "It's Still Rock & Roll To Me," neither of his other #1 hits--"Tell Her About It" or "We Didn't Start The Fire"--were to be heard. He also didn't play anything from his quartet of #3 hits: "Just The Way You Are" (except for a tease bit he did about its opening riff), "River Of Dreams" (it was played as part of a prerecorded medley for the dancers), "Uptown Girl," & "My Life" (the latter of which was the biggest oversight of the evening). Come to think of it, of his 13 Top 10 hits, only 2 were accounted for: "It's Still Rock & Roll To Me" & "You May Be Right." The fact that this went unnoticed during the evening made me wonder--how many artists could fill a comprehensive overview of their career & leave out almost all of their biggest hits? Perhaps this, more than anything else, is proof that Billy Joel truly deserves the Gershwin Prize For Popular Song. So congrats, Billy. & thank you for helping us all to forget about life for a while.